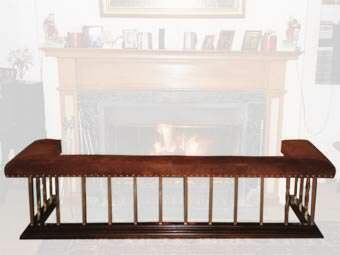 Club fender seats are a made-to-measure fireside seat that will enhance the look of your room. Fender seats take up very little room but – as well as looking stylish, contemporary or traditional – are also very practical: providing two or more additional seats. Rockingham Fender Seats have been producing fender seats for over 25 years, here in our workshop in Peterborough, Cambs, United Kingdom. All our fender seats are lovingly hand crafted by Martin, our director, so can be finished to your exact requirements, whether it be for a period or a contemporary home. We can help you with measuring and can even visit you to measure and discuss design and materials; please just ask. If you wish to use your own fabrics to upholster the seats – we can do that too. You can view our most popular fender seat designs, along with guide prices, or look at our Customer Showcase for design inspiration! We ship our products across the world; often delivering to as far afield as the USA and Australia. If you have a club fender in need of repair, we can – in most cases – carry out the necessary work, including full restoration to return an old faithful to its original condition. We can even adapt your existing club fender to fit a new home. 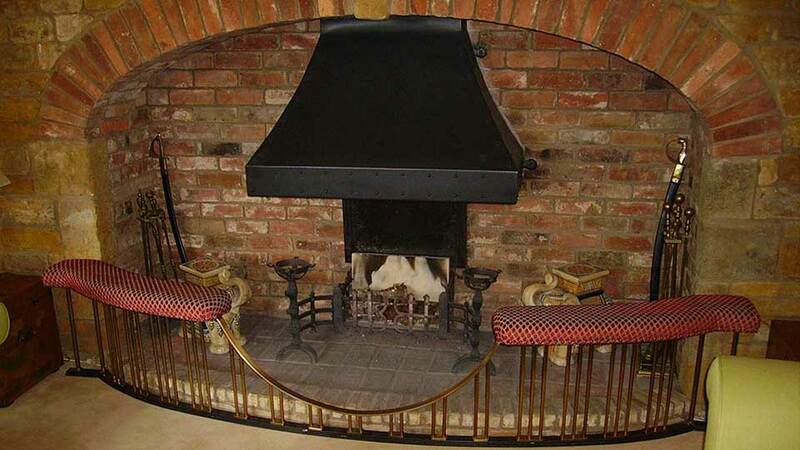 We also make bespoke low level fenders and fender guards, and are happy to supply fireguards, fireplace accessories, fire-baskets and fire-backs of the highest quality. Our website is designed to complement our old fashioned, high quality service – not replace it! So we would be delighted to discuss your requirements. (Definitely no call centre!) Our offices are open 8am to 4pm Monday to Friday (other times by appointment). 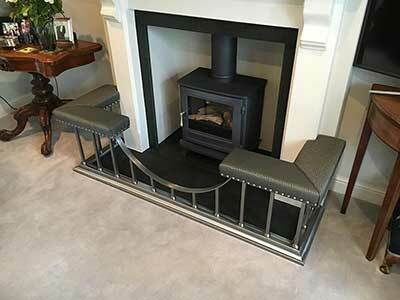 If you’d like to find out how we could design and build a bespoke fender seat, low fender or fender guard to enhance your home please get in touch – we’d be delighted to hear from you. Often it is difficult to imagine how a fender will look from isolated pictures taken in our workshop. 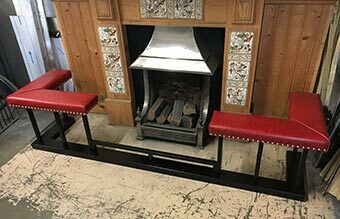 Here is an area where our customers have been kind enough to share images of their fender seats and low fenders ‘in-situ’ to help you envisage how a fender might look in a home or hotel setting. Deciding upon a fully bespoke design can be time consuming; to help make the process of buying a handcrafted fender seat as easy as possible, we view our top seven designs here. We try to keep a range of popular fender seat designs in stock for sale at competitive prices and usually with quick delivery times. These are all “as new” and the price includes upholstering in one of our standard leathers or in a fabric supplied by you. 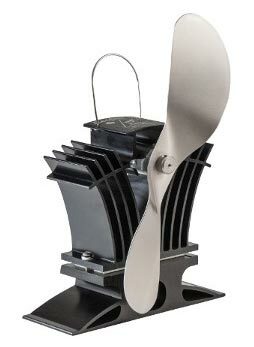 We are an Ecofan® stockist. 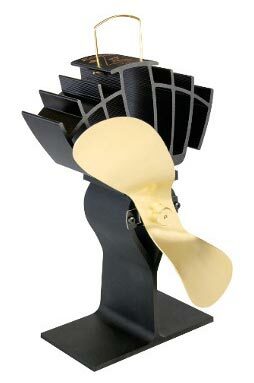 The Ecofan® is a heat powered stove fan designed to provide fuel savings and faster heating times. Enjoy the heat from your woodburner/stove up to 38% faster! 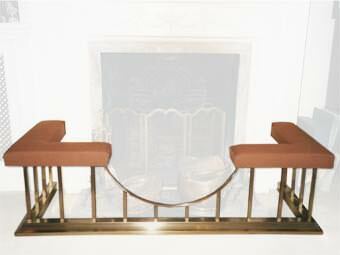 A low fender provides an attractive finishing to your fireplace and can be accommodated in most homes. Fender guards are fender seats but instead of having seats, the top is finished with a plain or decorative top rail. 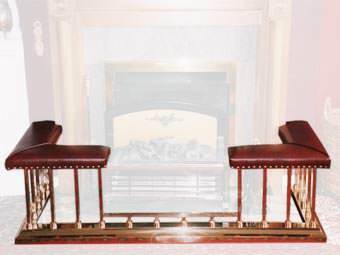 We offer both ‘off the peg’ fireguards and a ‘made to measure’ service. 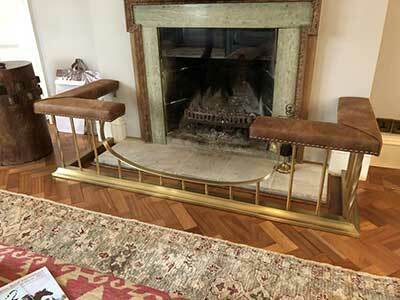 We supply a broad range of high quality fireplace and hearth accessories. We supply a broad range of high quality firebaskets. A range of traditional cast iron firebacks. Over the Holiday season, we had many compliments about the fender from friends and relatives who visited us. The warm seat on the fender next to the fireplace was the most popular place in the house!. Our fender seat is so beautiful and we are thrilled that it’s a perfect fit. The workmanship and attention to details is superb. It has been such a pleasure working with you that we hate for it to end! You made the seat in under four weeks and then quickly turned around and shipped it out. I couldn’t believe how easily it made it through customs. I ordered my furniture from the states, which is in storage, two weeks ago and the fender arrived first. My new home now sits with my first piece of furniture in it – the fender seat! We love it. Thank you so much. 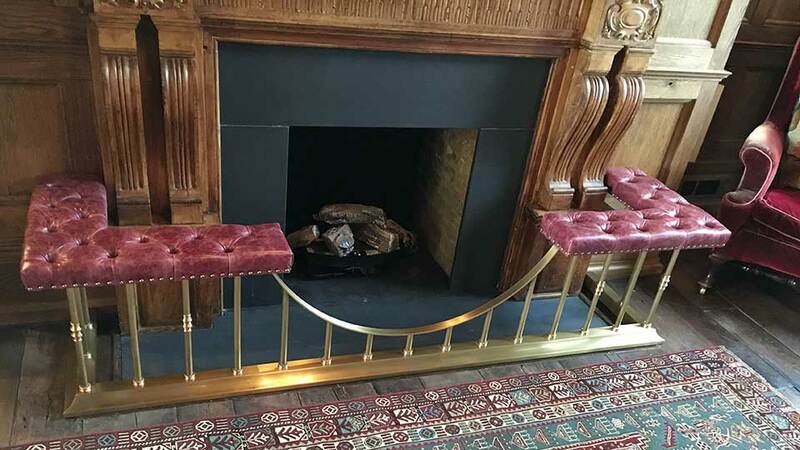 I should like to thank you very much for the beautiful fender which you have made to conceal the considerable chipping of my hearth by a carpet fitter. The fender is plain and neat as I requested, and I am most satisfied with the speed and very high standard of your work. 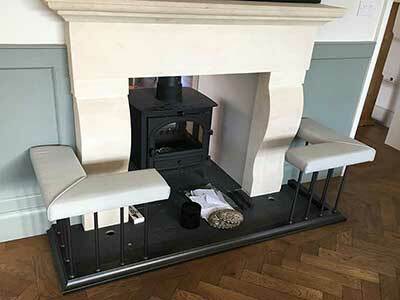 We are so pleased with the fender as it fits like a glove and blends in perfectly with the fire surround. 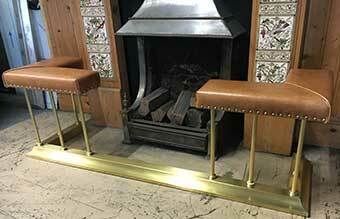 I have to say that I am very impressed with the quality of the workmanship so well done indeed. I am not in the habit of sending e-mails like this so please take it as a great compliment! It has been a pleasure to do business with you and I wish to say that I have been impressed by your professionalism in sorting out my order, your help with guiding us with regard to measurements etc. and with the way you have kept us informed. The fender is magnificent and we are thrilled with it. I know that it will be much admired by all our friends and I shall commend you to all of them. I am just emailing to say a very big thank you for the most wonderful fenders your team have made. They look magnificent and fit perfectly. Both fireplaces now look superb. Thank you very much. Please also pass on my special thanks to the gentleman who delivered and fitted the fenders, he was most charming and helpful. It has been a pleasure to do business with you. 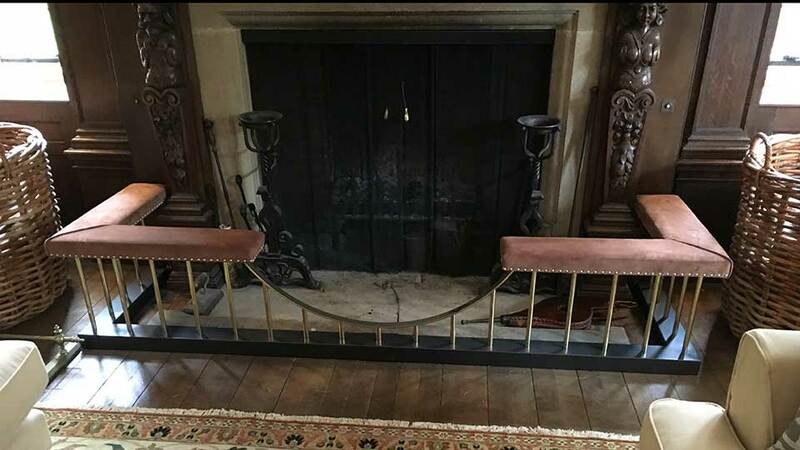 We are absolutely delighted with the fender, which arrived yesterday and looks as if it has been around our fireplace ever since the house was built. It is gorgeous. 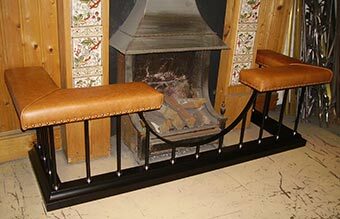 Hi – just a message to say many thanks for the fenders which look superb in our house in the Lakes. The service we received was friendly and efficient – 10. out of 10!